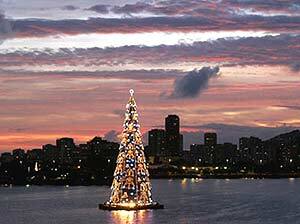 Picture of the Christmas tree built in the Lagoa Rodrigo de Freitas in Rio... Merry Christmas (it is burning hot here today!). The city of Itu in Sao Paulo already has a reputation for all things "big". Now the city expects to make it to the Guiness Book of Records with the tallest artificial Christmas tree ever built. With over 6,500 lights, the tree is 74 meters tall, and can be seen from over 15 miles away. One of the best things about being home (despite the staff of maids) is to see our gardener at work. I tried to get a couple of shots for your viewing pleasure (not that I don't have anything else to do, but it was 7am and no one was really even up or working), but it proved to be a difficult task (he'd probably kill me if he knew what I was doing). Unfortunately, it is like 75 degrees here, and people seem to think that it is the glacial era... Mr. Gardener is usually at his best in some frayed and stained ol' pair of shorts, but he went for some baggy sweatpants today that really do not do him any good. I am sure I will still see him a few more times before I head back to the US, so let's hope the weather gets much much warmer and that I manage to find a better angle for detective-like pictures in this house. Alright, so I guess I have been a bit absent for the past few days, but it was quite a journey to get to Brazil this time of the year. I missed one of my flights (thanks to some lovely folks at Customs) and was stranded in the Sao Paulo airport (which felt strangely similar to New York's Port Authority) for over four hours. After hopelless hours of reading, starvation, and a quick cleaning session in the Men's Bathroom (a la Charlize Theron in "Monster"), I finally caught a flight that got me home safe and sound. Have been here for a couple of days already, and the Brazilian reality is now sinking in. I no longer sport a watch or any piece of jewelry (not that I walk around covered in Harry Winston anyways), and try to stick to places with security and valet parking. Who would have thought Brazil would be the new Colombia? The January Issue of W magazine features Rosie, Dixie, and Tai, a trio of very hip elephants, dressed in custom-made designer gear and photographed by Mr. Bruce Weber. 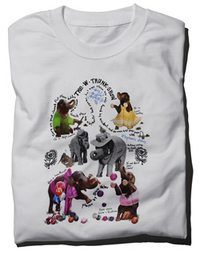 A portion of the proceeds from the sales of this limited edition W Trunkshow Tee will benefit the conservation group Elephant Family. Designers that contributed to the project include Helmut Lang, Manolo Blahnik, Karl Lagerfeld for Chanel, Marc Jacobs, Nicolas Ghesquiere for Balenciaga, William Ivey Long, Isaac Mizrahi, Dolce & Gabbana, Yohji Yamamoto, and Ralph Lauren.